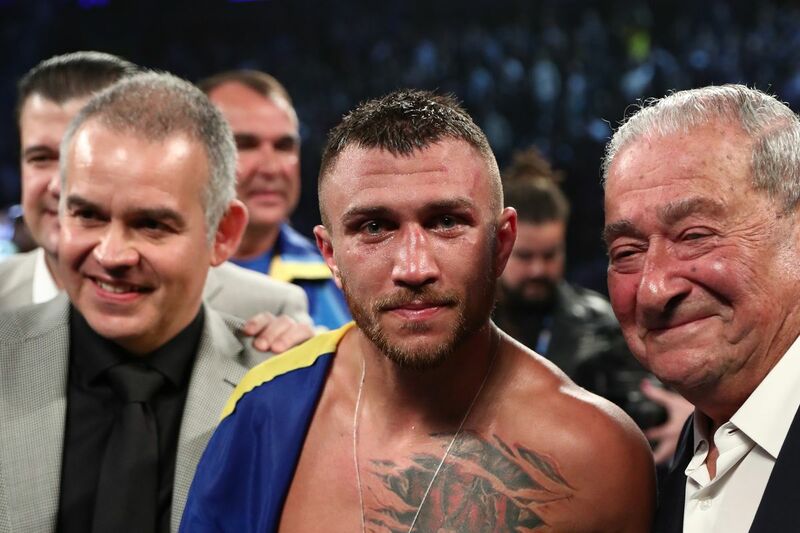 What’s next for Vasyl Lomachenko? First time in the big room, first time getting knocked to the mat as a pro, first time snagging a crown in a third weight class, and first time in a long time that he is seen as someone who isn’t invincible. The May 12 win for Vasyl Lomachenko stirred the 10,000-plus who grabbed a seat at Madison Square Garden, especially when Loma revved the engines and bore in on Jorge Linares in round 10. His combo, head shots which distracted the Venezuelan, and two body shots which rattled his innards to the point he was counted out, made him the conqueror in yet another division. So much to herald and celebrate and ponder. Because, as the post-fight press conference and chatter round midnight at the Garden told me, this win didn’t make Loma’s stock pop like a crypto coin; it conjured up some new questions, and maybe offered us an answer as to where his career goes from here. The fighter hit the post-fighter presser, which by the way was quite well attended, as far as these things go, and was not surprisingly in high spirits. But his mood was influenced by an infusion of humility, which he kindly shared to us media mostly in English. Promoter Bob Arum took the mic and handed it to Loma. He thanked the fans, the Garden “my big team,” “my big promoter,” and his family. “I wanna say thank to Linares for giving me one more lesson in this interesting sport,” the 11-1 fighter stated. The victor still gets queries fed to him in Russian by manager Egis Klimas, and when asked if this was the deepest he had to dig to win, replied that his hand was hurting from round two on, and that maybe contributed to the difficulty he had in obtaining the win. To that noted, one judge had it for Loma by two, one had it even, and one had it for Linares by two points. Punches landed were quite close and Linares threw more of them. As I noted while doing a postmortem with fellow media, in maybe three of the quite close rounds I watched ringside, I used ring generalship as a tie-breaker when choosing a round winner. And Loma was the better ring general on this night. I saw it 6-2-1, with an extra point to Linares for the knockdown, at the stoppage. Loma was asked about the scorecards. “It’s not my job, I can’t comment on their job,” the 30-year-old fighter said, staying in his lane, staying humble. And that knockdown, off a right hand, he called it a “flash” knockdown. Still, the fact that it occurred tells us something, doesn’t it? One, that Linares’ hand speed and timing and accuracy is A-grade. Two, that maybe 135 isn’t Loma’s best place to do business. Me, I think selectively but of course he can be A-plus grade at 135, but some foes there will have more power than his chin might like. In that vein, I think we see Loma versus WBO 135 champ Ray Beltran in his next outing, which comes in August in California. 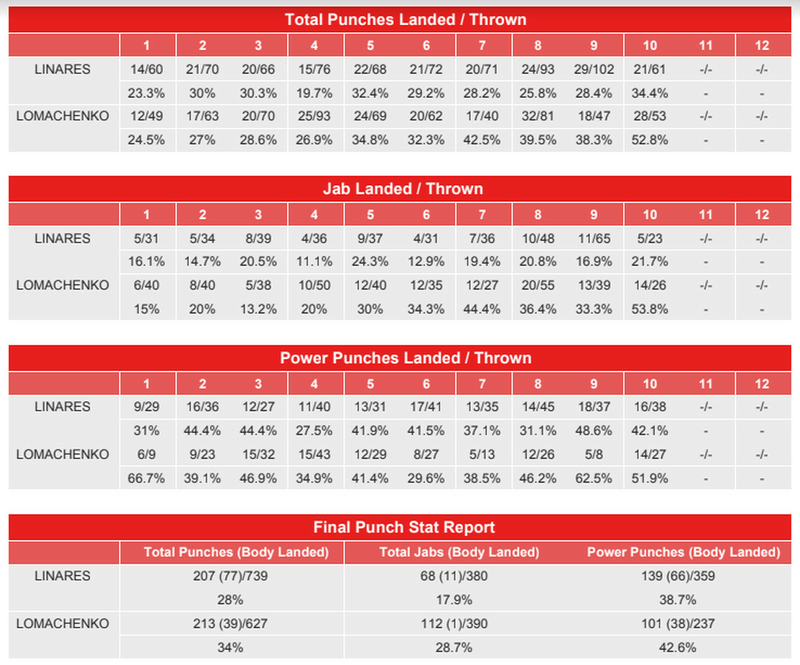 Beltran’s hand speed and timing and accuracy are not on par with Linares, I tend to think. Loma also said he came to 135 to get all the titles, and he’d be open to fighting the Mikey Garcia vs Robert Easter winner. Arum told Ryan Songalia that he’s not too optimistic that “negotiating” with ex-Top Rank client Garcia would go well. Read into that what you will. I believe the fans demand the fight. Loma said he relaxed too much, and “he caught me,” so there’s one of those lessons learned he referred to. At that point, Linares walked in, looking still like a rock star, though one that had done a four-hour show and was turned down by the sweetest groupie backstage. Also, the subject of a rematch came up. Loma would do it, he’s open to it, if the promoters see that as being a good idea. Arum told me ringside right after the fight that a rematch between them would more so be a good idea for a little bit down the line. Linares told me that “his punches to the top weren’t really bothering me,” but in that final flurry, two body punches surprised him, with their placement and power. He then saluted Vasyl for his skills. So 135 isn’t a bridge too far for Loma. But being a true sportsman with old school values, he wishes to push himself and see what his limits are, continue to edge out and find his comfort zone. This effort had more people thinking that Mikey would do better than Linares against Loma, and thus, is a true threat to down Loma. I’m not sure. Linares’ hand speed-timing-accuracy package is quite formidable in spots. Also, maybe Loma’s movement gives Mikey a bit more trouble than it did Linares, who handled it pretty well, though it can be argued that maybe Loma didn’t utilize his feet as much as we’d seen him in the past. In rounds when he was dancing and popping, he more clearly won the rounds. I really do think Arum is leaning to seeing if he can make Loma vs Beltran next, with Beltran also in the Top Rank family. Makes sense, being that now more people think 135 is a bit of a danger zone for Loma.